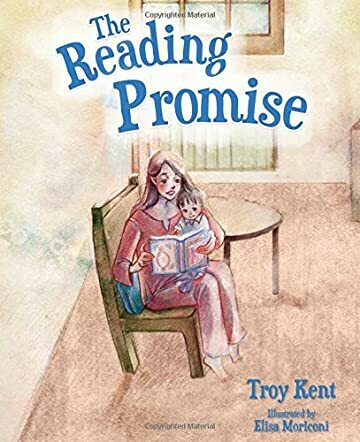 The Reading Promise by Troy Kent is an adorable story of Daniel and his mother, Katherine, who used all her money to buy food and clothes for the baby. She felt sad knowing she could not buy any fancy clothes and toys for her son. Katherine joined a public library and she made a promise to Daniel that she would read aloud to him every day. When Daniel grew up, he loved reading more than anything else. Daniel became an adult, lost his mother, got married, and had a child of his own. He found the first book that his mother had read out to him and he did the same thing his mother did to him; he began reading books aloud to his little daughter. It's a heartwarming story that shows a special bond between Katherine and Daniel, and how she weaves into his mind the importance of reading books and how the circle of life continues when Daniel has a daughter. The illustrations are lively, vivid, and give a good pace and movement to the story. It will make an excellent bedtime storybook and can be used for read aloud sessions in classrooms and school libraries. The book captures the struggles and financial hardships of a mother beautifully and also the importance of spending quality time together, and a mother's love and devotion. This story will touch the hearts of readers and this story will encourage children to enjoy the reading experience. A recipient of the Mom's Choice Awards (Gold)! The Mom's Choice Awards® (MCA) evaluates products and services created for parents and educators and is globally recognized for establishing the benchmark of excellence in family-friendly media, products and services. Using a rigorous evaluation process, entries are scored on a number of elements including production quality, design, educational value, entertainment value, originality, appeal and cost. Around the world, parents, educators, retailers and members of the media trust the MCA Honoring Excellence seal when selecting quality products and services for families and children. A tenderhearted story about a mother and son, who share a special bond by Daniel’s mother reading books to him since he was a young boy. The reader experiences the boy growing through stages in life until he becomes an adult. As an adult, Daniel becomes a father he discovers and repeats his mother’s show of love and creates his own special bond with his brand new daughter. This is a very touching story with a clever tactic to inspire children to read. The Reading Promise is the heartwarming story of a young mother and her son, Daniel. When Daniel is just a baby, his mother doesn't have much money. She worries about being a good mother, then soon decides to make her son a promise. She realizes books at the library are free. There might not be much she can do for her son from a monetary standpoint, but she can read to him. So while he is just a baby, she vows to read to him every night. As Daniel grows up, he and his mother find countless ways to experience the world through books. Written by Troy Kent and illustrated by Elisa Moriconi, The Reading Promise is simply wonderful. Vaguely reminiscent of Robert Munsch's Love You Forever, this children's picture book is sure to tug at your heartstrings. Highly recommended for home and school libraries, The Reading Promise earns the Literary Classics Seal of Approval.